Continuing in my series of Purple Food, candy onions have been one of my most rewarding discoveries, and are high in flavonoids and are considered a super anti-oxidant. One recent lazy Sunday night, D.C. and I sat on our deck under an umbrella table eating two pizzas, one cooked in the oven at 450 degrees on a pizza stone with tomato and basil and one (just for kicks) thrown in a cast iron pan and placed in our gas grill hovering between 700 and 900 degrees, topped with mozzarella, caramelized candy onions, spinach and mushrooms. As we both bit into our respective pizzas, we had a “food” moment. “This is closest we have come to tasting Italy.” And, we realized, not only was it clever to try the “grill” method, which did beat out the oven method, but, we owe it all to Marcella Hazan. We had tried many recipes for pizza dough, with marginal to good results. Nothing comes close to Marcella’s recipe. My husband is a pizza aficionado. The right crust for pizza, the correct method for making cappuccino and a love for red wine are the three things he brought back from Italy. Ever since our trip where he devoured about 17 pizzas all the way from Venice to Sicily, he has been on the search for a good pizza made the way the Italians make a pizza. A good pizza must be thin, crispy, and chewy and not weighed down by heavy toppings. It’s easy to get the thin, crisp part, but you usually end up with a cracker or a pizza that breaks in half. We call that flatbread. It must have the “chewy” and in order to get that chewy, you must start with a good dough, and manage to get your pizza into a very hot oven. What does this mean, and why is it so hard to find? The Italians, namely, the Neopolitans set the standard using a thin crust that is cooked very quickly (2-3 minutes) in an extremely hot brick oven. And, not just any brick oven. There are some families in Italy that have such a special recipe for the making of the brick oven, that they place a privacy screen in front of the construction. Note the importance and commitment Italians give to the crust. It’s paramount to what makes a pizza good. After Marcella’s pizza dough recipe, we will NEVER try another recipe again. It cannot be improved upon. Her recipe is more work than most, and the technique a little unusual, but I implore you to follow it exactly and once you get the kneading by hand, just consider those 10 minutes as exercise, and do NOT get our your processors and kitchen aids. I banged the dough on the table like a wild girl, but at the end you will reach pizza dough perfection. It will move in your hands like silk. You will NEVER need to reach for more flour as the stickiness disappears and if you can think back to the feel of play dough, you will understand what you are looking for, but with a little more give. 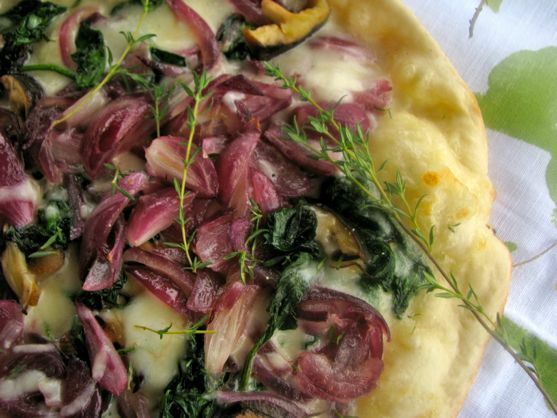 You can roll it out thinly, but if you like a thicker pizza, this is still your recipe. Prep time is about 20 minutes just to get to the dough and then a minimum of three hours waiting for it to rise. It’s worth every minute. Dissolve the yeast in a small portion of water for 10 minutes. Then in alternation fashion, you will add olive oil, more water, more flour, more water, more flour and stir with a wooden spoon. Intense kneading will result in a supple, perfect dough. Notice what three hours will do for your dough. 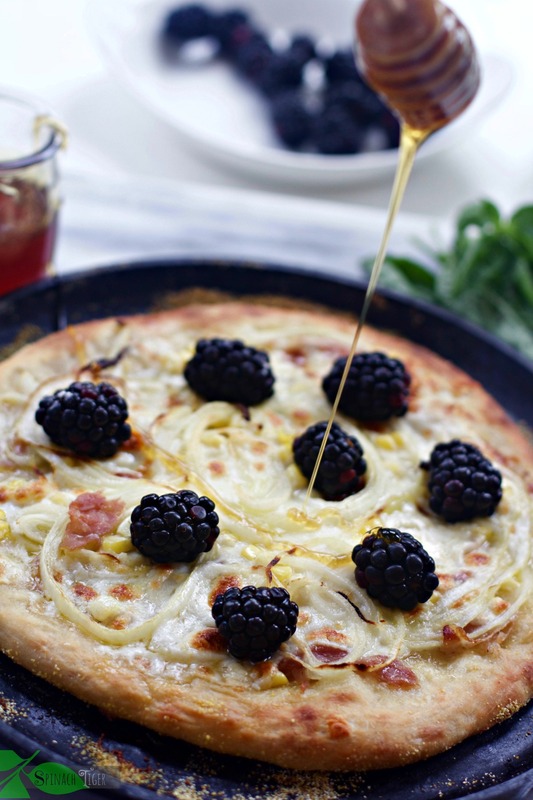 Using a little corn meal, the pizza dough easily slides into a pre-heated cast iron pan. Notice how nicely done the bottom crust is. When you bite it, it snaps, crunches and chews. As if it wasn’t enough to discover the perfect pizza dough, my local farmer’s market provided me with a new (to me) beautiful onion, the red candy onion. They are a gorgeous purple and they stay this beautiful jewel tone when sauteed. Of course, they have a bit of a sweetness (thus the candy) and come close to a shallot, which is why I assembled them with fresh thyme out of my garden. I ask you, is there a better herb for shallots or candy onions than fresh thyme? I think not. Using a few shiitake mushrooms, and just a bit of raw spinach, the result was thing crunchy crust, with perfectly edited ingredients. There was an onion in every bite, but some bites had spinach, some had mushrooms, some had both. 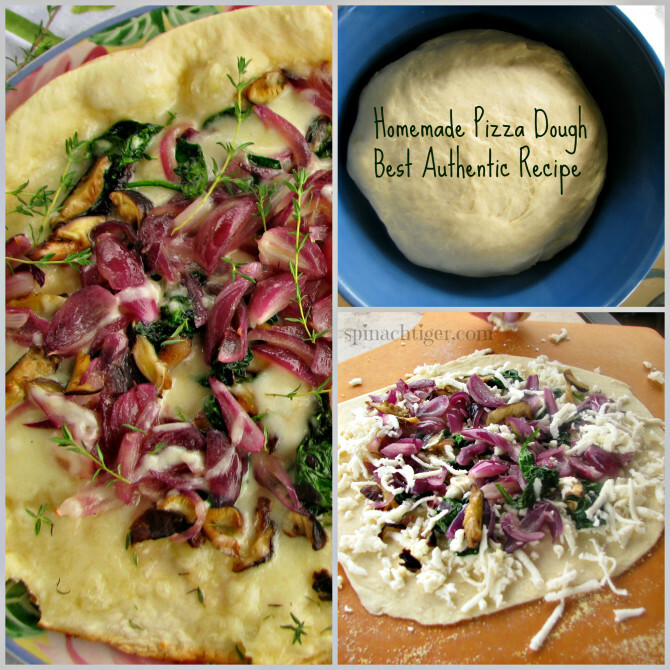 Make your dough in advance and then enjoy the pizza making process. You can make the dough the day before, and refrigerate. Just leave out for one full hour to bring to room temperature before using. If you don’t have a grill, you can use a pre-heated pizza stone at the highest setting you can set your oven. Some ovens only go to 450. That will work. If you are using a grill, pre-heat for 30 minutes at the highest setting. The issue I have not solved yet with grilling is that the top doesn’t get as much heat. I sauteed the onions in advance, as well as the mushrooms and spinach. We tested this dough in the oven at 450 on a pizza stone and it was very good. We further tested it in a cast iron pan, inside of our gas grill that at one point measured 700 degrees, and it was outstanding. This dough will not fail you. It is not sticky. It will slide right into your oven, and with a bit of practice, you can get it nice and thin. The crust will turn out crisp on the bottom, NOT doughy and gooey, but firm and chewy on top. His comment made me happy. We are sitting on the deck, each with our own pizza and he just happily remarks, “not since Italy.” He’s thinking, “I just fell more in love with my wife.” And, I’m thinking I hope this is the right tease for another trip back to Italy. Onions were caramelized on top of the stove in a tad of butter and olive oil and removed to a bowl. Spinach followed in same pan for a few minutes. Mushrooms were sauteed quickly. Grilling at highest heat for approximately 4 minutes. Time may vary according to the pan you use, the thickness of the crust, the heat of your grill. yes me tool bagels meh but bylais woo happy mouth. there’s a new place in bh that brooklynizes their water. not sure exactly what that means but apparently their bagels are supposed to be uh-mazing.